A smaller show of 195 head last Monday night met with another fine trade. Steers sold to £1,330 for 600kgs, heifers to £1,190 for 560kgs, fat cows were a super trade with some fantastic prices paid and a top price of £1,005 for 6290kgs. Richard McVicker, Bushmills, Parthenais, 600kgs, £1,330. 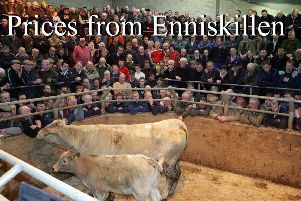 J G McNeill, Cushendun, Blonde d'Aquitaine, 370kgs, £900, 360kgs, £870, 500kgs, £1,030. Michael McKenna, Dervock, Limousin, 440kgs, £960, 340kgs, £820, 390kgs, £905, 400kgs, £950. Jas Heaney, Ballymoney, Charolais, 590kgs, £1,270. Ryan McKay, Dunloy, Limousin, 300kgs, £805, 300kgs, £785, 260kgs, £700. Raymond Cupples, Broughshane, Aberdeen Angus, 460kgs £895. R McVicker, Bushmills, Hereford, 700kgs, £1,300, 700kgs, £1,260. Sam Creith, Bushmills, Hereford, 500kgs, £1,035, 560kgs, £1,055, 590kgs, £1,095. Arthur Devlin, Ballycastle, Limousin, 500kgs, £1,015, 550kgs, £1,195, 450kgs, £990, 400kgs, £905, 470kgs, £970, 500kgs, £1,055, 510kgs, £1,020. J W Caldwell, Kells, Limousin, 500kgs, £955, 460kgs, £895, 480kgs, £930. Chris Freeman, Bushmills, Simmental, 310kgs, £820. Sean McDonnell, Glenariffe, Simmental, 370kgs, £825, 330kgs, £780. H Nicholl, Portglenone, Aberdeen Angus, 480kgs, £910. Donal O’Donnell, Martinstown, Limousin, 330kgs £765. Darren McLaughlin, Armoy, Aberdeen Angus, 370kgs, £770, 300kgs, £655. Horace Stonge, Finvoy, Hereford, 280kgs, £600, 300kgs, £696, 330kgs, £670. Colm McFall, Bushmills, Friesian, 530kgs, £970, 530kgs, £935, 540kgs, £880. M McKenna, Ballymoney, Limousin, 390kgs, £885, 400kgs, £855. Ray Cupples, Broughshane, Aberdeen Angus, 470kgs, £930. Jas Heaney, Ballymoney, Charolais, 560kgs, £1,190. Ryan McKay, Dunloy, Limousin, 230kgs, £650, 290kgs, £700, 270kgs, £640, 300kgs, £740. B Bailey, Ballycastle, Limousin, 380kgs, £840, 370kgs, £790, 350kgs, £760, 360kgs, £795, 380kgs, £790. Ray Cupples, Broughshane, Aberdeen Angus, 430kgs, £790. Jas Heaney, Ballymoney, Charolais, 600kgs, £1,190. Pat McKay, Martinstown, Simmental, 500kgs, £985, 550kgs, £985. John McAllister, Dunseverick, Limousin, 400kgs, £845, 405kgs, £815, 440kgs, £870, 340kgs, £720, 340kgs, £695. S Huey, Armoy, Limousin, 480kgs, £970, 500kgs, £990. J and W Caldwell, Kells, Limousin, 500kgs, £940, 440kgs, £820. Wallace McCracken, Limavady, Limousin, 450kgs, £980. S McDonnell, Glenariffe, Simmental, 300kgs, £690. Vincent McErlain, Armoy, 620kgs Limousin, £1,005. W and J O’Kane, Carnlough, Limousin, 600kgs, £1,110. Sean McBride, Ballyvoy, Aberdeen Angus, 770kgs, £1,000, 810kgs, £1,000, 680kgs, £950. Alistair Getty, Bushmills, Friesian, 510kgs, £690. B Laverty, Loughguile, Limousin, 600kgs, £740, 490kgs, £700. Paddy McMullan, Corkey, Parthenais, 630kgs, £855. Paddy Black, Ballycastle, Friesian, 490kgs, £775, 580kgs, £760. R McBride, Ballycastle, Hereford, 600kgs £760. Wallace McCracken, Limavady, springing heifers, £1,260. Liam McCullough, Mosside, Belted Galloway cows in-calf £970, £990, £950, £945, £945, £950, £890, £870, £880, £840, £810, £780, £780. Belston Farms, Moira, Belted Galloway cows, in-calf, £890, £820. Sale every Monday night at 6.30pm sharp.